Thankfully the Celtics and Wizards delivered us one 7-game series in what was an otherwise surprisingly non-competitive second round. John Wall and Isiah Thomas both had breath-taking moments, but in the end, it was the notoriously cold-blooded Kelly Olynyk who closed out the Wizards just as the model predicted (OK, maybe not that last part). In the Western Conference, the Warriors are clearly bored, and the Spurs took down the Rockets in one of the strangest, most anti-climactic elimination games I have ever seen. Let’s hope that James Harden gets his talents back from the aliens in time for next season. Through two rounds, the model is 11 for 12 on series predictions. The one miss was picking the Raptors over the Cavaliers. As we explained in our round 2 preview, our model has historically struggled in predictions with Lebron-led teams, as he has the ability to coast through the regular season, and then bring his game back to best-in-the-world level in the post-season (more on the Cavaliers later). Below is the updated Model 284 playoff bracket. Conference Finals probabilities have been calculated after adding the results of rounds 1 and 2 into our playoff data to further train the models. Our model-generated predictions are siding with the favorites – the Golden State Warriors (66%) and the Cleveland Cavaliers (59%). All three of our models picked the Warriors over the Spurs. 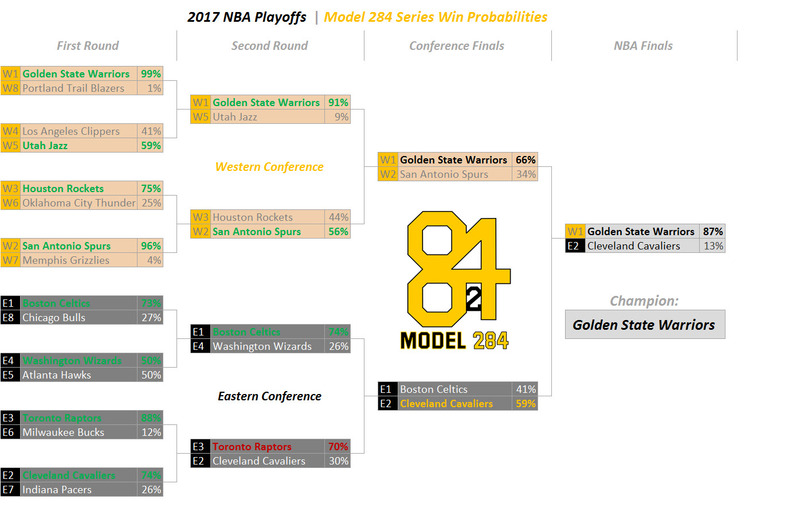 On the other side of the bracket, two of the three models chose the Cavaliers while the third sided with the Celtics. Below are the probabilities of the 4 remaining teams advancing to the Finals and winning the Championship. Data from the regular season suggests that the Cavaliers were a good, but not elite team this year, which is reflected in our predictions for them. However, through the first two rounds of the playoffs, the Cavs have gone 8-0 and look like the most serious threat to Golden State. This improvement can be mostly attributed to their success on the offensive end. 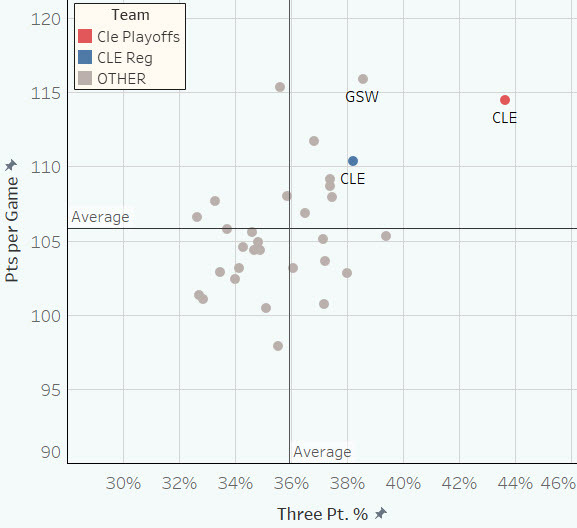 So far, Cleveland is scoring 115 points per game in the playoffs and shooting a blistering 44% on three-point attempts. Both of these numbers are significantly better than what they did in the regular season. The chart below shows points per game by three-point percentage for all NBA teams this season. The blue dot represents the Cavaliers regular season numbers, while the red represents what they have done in the playoffs so far. The Cavaliers have made subtle improvements on the defense side as well. Through 8 playoff games, they are at least playing above-average defense. 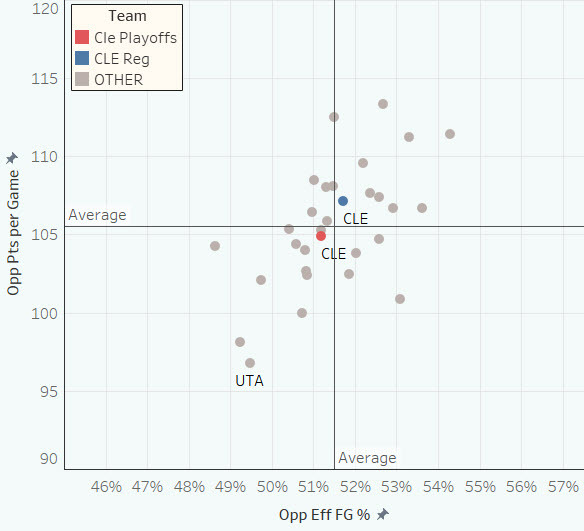 Considering that Deron Williams, Richard Jefferson, Channing Frye, and Kevin Love play significant minutes, slightly above average may be their peak on that end of the floor. The chart below shows opponent points per game by opponent effective field goal percentage. Cleveland’s three-point shooting success is driven by Lebron’s ability to get to the rim and throw darts to shooters all over the floor with pin-point accuracy. Lebron and Kyrie Irving are both good scorers themselves, but this team is most dangerous when J.R. Smith, Kevin Love, and Kyle Korver can step into wide open threes. It will be interesting to see how Boston defends the Cavaliers. Perhaps the best way to play them is to stick to their shooters like glue, and force Lebron to score 40-50 himself.